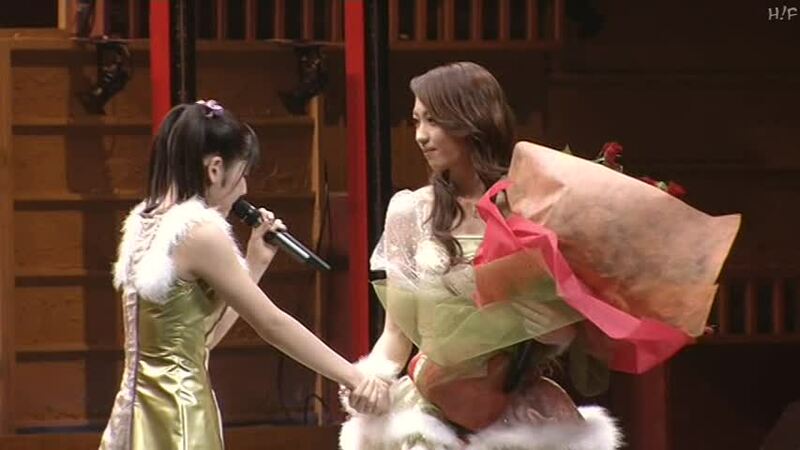 It’s a bit fuzzy now, but I’m pretty sure I first heard of Momusu through watching Utaban. Seeing a young Iida Kaori cowering beneath a giant balloon (that Mr. Ishibashi gleefully threatens to pop at any moment), was one of the funniest things I’d ever seen. My brother kept on showing me these increasingly epic moments until I wanted to know exactly who they were. I was directed to the Joshi Kashimashi Monogatari (the original version) PV. These beautiful, fresh-faced girls dance and frolic around inside a train car, pushing each other around and their choreography looks like so much fun. I’d grown up with Much Music and I’d never seen anything like that (and I lived through the Spice Girl years!). I knew nothing about idol culture, let alone Japanese culture, except what one can glean from anime. I didn’t know anything about their origins either. Bro lent me some CDRs and when I was done watching those a hundred times I watched every subbed thing I could get my hands on. In 2005 there was a lot more subbing going on; it was far easier to find entire specials like the classic “Bakajo” test on MecchaMeccha (the girls are forced to take a long exam and their various terribly wrong answers are mocked afterwards by the hosts), the summer games on HeyHeyHey (in which the hosts ruin the shaved iced segment by getting into an impromptu syrup-fight), or full episodes of Hello! Morning. I probably watched more variety than PVs for a while. The current single at that time was Ambitious! and Kusumi Koharu had just been added to the group. I watched the current stuff a lot until Bro started suggesting older stuff. As For One Day was something special. Yaguchi Mari was the first member I remember noticing during my first viewings of Joshi, when picking a favourite seemed really important. She has short golden hair in that pv and she’s probably in the best shape of her life, but I loved her aggressive dancing more than any of that. She’s still one of my favourites. Despite all her personal issues over the years, it’s very hard to dislike Yaguchi. Then upon viewing the older pvs, I grew to really love Abe Natsumi, even though loving her felt very cliché. She was the face, after all. Hers was probably the only H!P solo career I followed to the point of purchasing an actual album or two. I still absolutely love her voice. I loved her character too, but I really love that voice. Then Mr. Moonlight happened and the legendary Yoshizawa Hitomi pulled me into a fan-gurl stalk-a-thon where I combed through any MM song or show just to hear her voice or watch her. Most people always remember their first “oshi” and I doubt if the experience ever repeats itself. I think at this point, I can safely say that no other member will ever affect me the way Yossy did (does). I’ve gone on and on over the years about why I love Yossy and how she’s the one that pulled me in and kept me there for many years. I suppose you could argue that Kuudo or Kaga are successors, but BOSS feels more like Yossy’s spiritual little brother (her style of Ikemen has never been at Yossy’s level and their styles are quite different – I don’t think she relishes it as much as Yossy did) and Kaedi reminds me more of Riho: that same stoic ambition, but with a dash of vulnerability that I don’t think I ever saw in Riho. When I first got to know Yossy, I wanted to know everything and it wasn’t enough. By the time she graduated, though, I was so deep into the H!P vortex that I knew I wouldn’t abandon Momusu. I came for the Yossy; I stayed for the dream. Nacchi was the face of Momusu for so long. I was blown away by her grad. Even though by the time I watched the concert, it had already happened (duh), seeing it for the first time, those grad messages, the sakura petals, Furusato – was very hard. Tsuji Nozomi had joined when she was very young and was very attached to Nacchi. In every special leading up to Nacchi’s grad, Tsuji hadn’t been able to give any sort of good-bye message without breaking down in tears. On the actual night, by the time it’s her turn to give her message, she is so wrecked that she can barely stand. She just sobs and wails and Kaori has to hold her up. Nacchi pats her head lovingly and all Tsuji can gasp out is, “I love you” (see it from this tumblr post). Kaori and Nacchi had been rivals from the start, but had been together for a long time; they had lived together and eaten bread crumbs to survive; they had seen their group morph from a vocal group into national idols. There is so much weight in that goodbye. Up to that point, Kaori had been leader the longest. 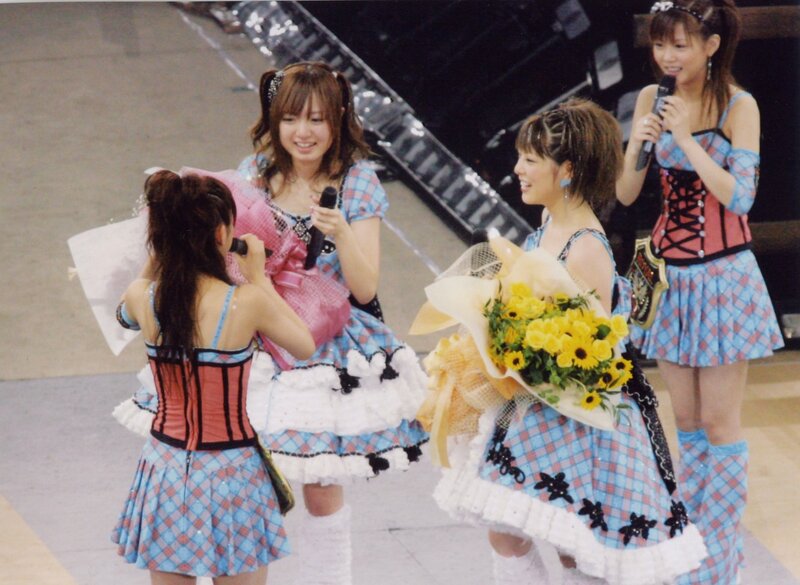 She’d taken over for Nakazawa Yuko, still the most formidable Musume to this day and the first leader of the group. She was a stern leader, very serious about the group and doing things properly. There were rumours of her being a jealous rival and we all saw her be a bit bratty on Utaban (which was amazing), but she transformed over the years into a goofy, classy, lovely woman. For her good-bye episode of Hello Morning, she travels around Japan and gathers fresh ingredients for nabe so she can cook a nice meal for her fellow members. During every grad message, she smiles warmly and patiently, and you get the sense that she really knows every single member well. This is the only grad I can remember when the entire sixth generation got really emotional. Shige starts crying within seconds, Winky bawls her eyes out and can barely talk, Eri’s in tears and even Miki chokes up a little when she thanks Kaori for calling her, “Miki-chan” despite all the trouble she’d given Kaori (she was, shall we say, ‘rebellious’ when she was first added to Momusu). But Takahashi and Niigaki just lose it. They hold things up for a good couple minutes. Takahashi cries and rambles and at one point, Niigaki scolds her to hurry it up and make sense (she doesn’t). Then Niigaki starts to give her message, proceeds to burst into tears, and is inconsolable for about two minutes until the rest of the Gokkies surround her and everybody laughs at how hopeless they are. The less I say about their performance of what will ALWAYS be the Gokkies quintessential song, ‘Suki na Senpai’ the less tears will ruin my keyboard. When Takahashi left, I was worried because they’d been relying on her so much. It felt like a watershed moment: the rest of the girls had to step up now. 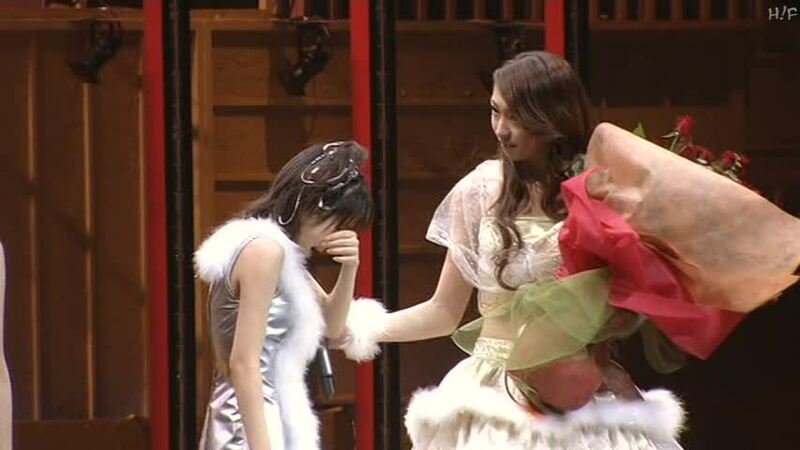 I loved this grad, because Ai is so down-to-earth and lovely, but two moments really kill me: when she wheels out Mitsui, who couldn’t participate because of her injury, and makes her a part of that stage and when Niigaki delivers her grad message and they hug and sob, nearly forgetting to sing. This concert was just so full of love. Shige was the very, very last of the DAI-SENPAI to leave and it was hard to watch her go. ’14 will always have a special place in my heart (they are the ones I met, after all) and this was the end of that incarnation. I remember shortly before her grad they had a small concert in which they performed the songs from Shige’s last Momusu album. I don’t think I’ve ever seen them performed since (not counting the singles, obviously). After this concert is over, Shige just breaks into unexpected tears because she realizes this is the only time they’ll get to sing these songs together. Fuku-hime gathers her in her arms and the rest of them glomp on and cry. Shige does most of her grad concert with an injury and the girls just seamlessly move into different positions to make up for this. It was very professional of them, but it was also undoubtedly the girls supporting their leader. When Fuku realizes that Shige has gotten injured during the medley and immediately runs back to where Shige is so they can sing together, Shige just grins at her, like she knew she could count on Fuku, and it makes me laugh and cry at the same time. *wipes eyes* There are more (Yuko’s for example – because it’s YUKO!! ; Tsuji and Kago singing I Wish for the last time), but in the interest of not getting dehydrated, let’s move on. I had never really been in a fandom, so I didn’t understand the compulsion to discuss every detail of something, the joy you get in sharing moments and stories and favourite aspects. I had no one to talk to about all these new things I’d discovered (Bro lived far away at the time), because Momusu can’t help but lead to H!P. H!P has a ton of amazing things to discover. I think it was around the release of Resonant Blue, my brother sent me a copy of Momusu’s 4th album: Ikkimasshoi, which still remains my favourite of all MM albums (even more than Second Morning, which I also love). If you like Golden Era Musume and you for some reason haven’t heard this album I highly, highly recommend it. It’s a near perfect album and it probably captures that period of time better than any of the subsequent albums. It’s a joy to listen to. I had so very many thoughts. My blog was born from a preponderance of thoughts and opinions and the lack of any one to squee with me. In the west, we don’t have anything like idols. Saying “manufactured pop-groups are the same” is inaccurate (Spice Girls, for example); it’s skimming the surface of what female idols actually do. The variety shows were fun and insane and the music made feel alive again (I love pop music and sanctimonious whinging about formula, repetition, manufacturing, or lack of talent, isn’t going to change that). I feel like I have a lot to thank Momusu for. I love writing and I hadn’t been able to write for ages. They got me writing. I was depressed and their music made me happy. Possibly the best thing is how much Japanese I was forced to learn in order to sing along to the songs l loved and on my way to understanding what Tsunku was getting at. Then there was the draw of all those variety shows (Japanese TV is awesome). I think a lot of bloggers started learning the language for similar reasons and this has changed career paths and led to lifelong friendships. I suppose you could argue any fandom is like that, but liking idols comes with two whole cultures, Japanese culture and idol-culture, and a ton of language learning (you learn even if you’re not trying). Then there’s the fact that Momusu was my gateway into Arashi (Hana Yori Dango Jun-baiting notwithstanding), Momoiro Clover, AKB48 and so many other Japanese things I love. 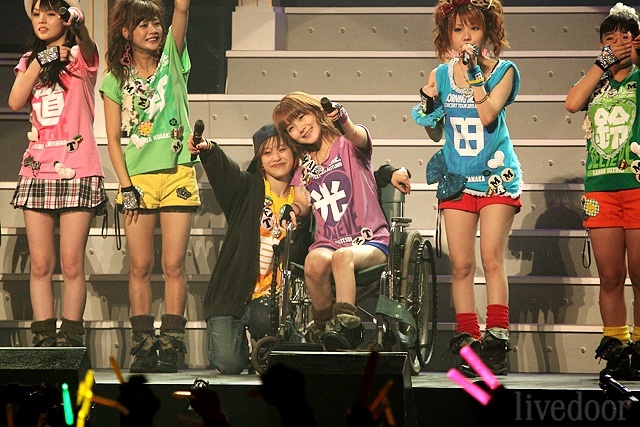 I can honestly say Momusu changed my life. I’m so glad they haven’t ended yet. I will never forget Yossy (full-stop), how I felt the first time a beloved member graduated, or the first time I was able to sing along to a song without romanji in front of me (it was Abe Natsumi’s ‘Datte Iketekanakucha’). I’m older and a smidge wiser in my fandom and even though I know and understand so much more, I can still understand and appreciate how Momusu is a beautiful dream. I’ve had the moment every idol fan has of realizing what is and isn’t real (“What do you mean there’s a script? ?”) and deciding I still love it (some people rage-quit or become the sanctimonious-whinge-ers I’ve already mentioned). I’ve overcome a lot of doubts about where the group will go. The thing is, whenever things change and I don’t like it, there is always something that keeps me a fan. It’s not blind loyalty, or delusions, but an affection that hasn’t faded and a constant curiosity: How will they grow in these new circumstances? How will this or that member handle this? What will Tsunku think of next? I think 20 years is a miracle. I’m so glad I met them. Previous postDancing, Singing, Exciting C-uuuuuute! Next postIn Which BOSS Leaving Isn’t Even the Half of it. Morning Musume was my gateway into so many things as well, so much music…. Getting into Morning Musume marked the end of what was a dark period of my life and the beginning of one that was happy and fun. I first got into Koi no Dance site, but it was at the time where Onna Ni Sachi Are first came out. 2008. I was 16. I’m 26 now. It’s crazy to think I’ve liked the group for so long and watched so many changes. I still like the group but I’m in a period of disconnect. I’m working too hard and don’t have time to keep up, and I’m more and more aware of the age gap which makes it harder…. They’re mostly the same age as my students so I struggle with that. I don’t know if it’s the lack of Tsunku… Everything feels so much less personal now and less like part of his game and more just like a company trying to make money. They have been such a huge influence on my life and their music holds so many memories for me.